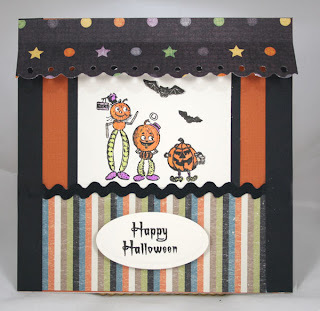 I loved this cute canopy idea that Tammy did a few weeks ago, so I thought I would try it with this Halloween card I was making for my Great-Grand children. I now have enough made to send to them. First, I cut the canopy and scalloped it with Fiscars Treading Water Punch and then I scored it with my Scor-Pal (for sale this week) to make a crease so it would fold nicely. I cut out the striped paper for the bottom, the black side strips. I stamped the images and used the square Nesties to cut it out. Then I cut a black mat for accent color. I stamped the Happy Halloween and used the Nesties large oval to cut and emboss it. Black ric-rac separates the image and the striped bottom. This was a fun card to make and I love trying new things. Joan you have been so busy!! Love all your cards lately... Beautiful. I really like your HAlloween card. Very cute. I like the HAlloween set from Crafty Secrets. I would love to purchase it. Do you ship to Canada? If so can you e-mail me your phone number so that I can give you a method of payment. Thanks Joan.. HAve a great day. what a cute image and love your card..very pretty! Oh my gosh Joan, the grandkids are going to love this! It's so adorable! This is VERY clever and really cute!! Isn't this too stinkin' cute!!! Love those little Halloween characters and the canopy?? Too cute! I have to give this style a try! Hope all is well Joan!! This is just adorable! LOVE the rickrack and cute, cute images! Your grandkids will adore these! What a cute card. Love that canopy! What treasures for you grandkids! They will love this! The canopy is perfect and the ric rac is wonderful, Joan! This is so fun -- love your canopy and just love that CS set!!! Too fun!! !